You need to target a high picking efficiency rate. With carton live storage racks, goods can be retrieved five times as quickly as from a standard shelving system. You want to pick high- and medium-turnover products with high stock rotation, avoiding idle time caused by a lack of supply. You want to complete customer orders quickly and efficiently, avoiding picking errors whenever possible. You want to quickly and clearly supply goods and parts on a FIFO basis at workstations or along production lines. Do some of these points match your experience? » Carton live storage racks are suitable for use as supply racks for finishing processes and as storage and picking racks. They can be used in a variety of situations and enable compact, clearly organised storage of goods. Reduced travel distances increase system efficiency; working times are reduced while picking performance is increased, and investment costs often pay off within a year. A highly sophisticated, ergonomic design reduces the physical stress placed on employees. » Buffered carton live storage shelves are designed so that goods are supplied for picking on the bottom level, while pallet spaces on the top level offer additional storage space. The single positions are used as item buffers for individual flow shelf levels in order to keep travel distances as short as possible when replenishing stock. This also allows vertical space to be used in full. » Automated or partly automated flow shelves enable particularly fast job throughput rates. Meanwhile, the picking error rate approaches zero and storage space is used optimally. BITO works only with carefully-chosen, well known fork lift truck manufacturers when designing the automated flow shelves. The brake rollers ensure gentle braking of containers and trays. This means that they can also be moved over the rollers in batches - without any risk of them tipping over. » Flow racks store all articles in a compact, clearly arranged space on the retrieval side. Products are clearly visible and travel times are very short, reducing picking times by 40 per cent compared with picking from conventional racking installations. This both increases pickers’ efficiency and reduces job throughput times. Storing goods in a more compact area results in space savings of 30 per cent or more. Strictly separating feeding and retrieval zones also increases employee productivity. » The loading process for carton live storage racks is completely independent of retrieval. This significantly reduces the risk of accidents. The robust, solid system components also guarantee a long service life even when used intensively. System investment costs often pay off within a year, meaning that when acquiring a BITO carton live storage system, you also avoid taking any financial risks. » BITO carton live storage racks are designed to be highly ergonomic. Integrating an optimal picking curve when designing the front of the rack promotes natural movements when picking items. Our plastic axle rollers are also extremely quiet, minimising noise load. Employees’ day to day work is also made easier thanks to clear visibility of all articles on the racks’ picking side, as well as short travel distances. » Live storage racks can also be rebuilt and expanded after initial assembly. This allows you to respond flexibly to changing conditions at any time. You can also equip existing pallet racks with BITO carton live storage shelves. » Thanks to strict observation of the FIFO principle and the storage of a single reference line in any given channel , production batches and sell-by dates can be easily monitored. Clearly visible storage also helps to avoid picking errors - and therefore costly shortfalls as well. » BITO carton live storage racks are available with a range of flow shelf dimensions. The shelves’ chosen dimensions will be primarily dependent on the size and type of goods being retrieved from them. Another determining factor is whether and to what extent conveyors are to be integrated into the installation. » The design of the front of the rack has a significant influence on the targeted rate of picking efficiency. It is essential to take ergonomic factors into account when considering picking efficiency. In particular, it is important to integrate a picking curve which reflects a natural picking motion. 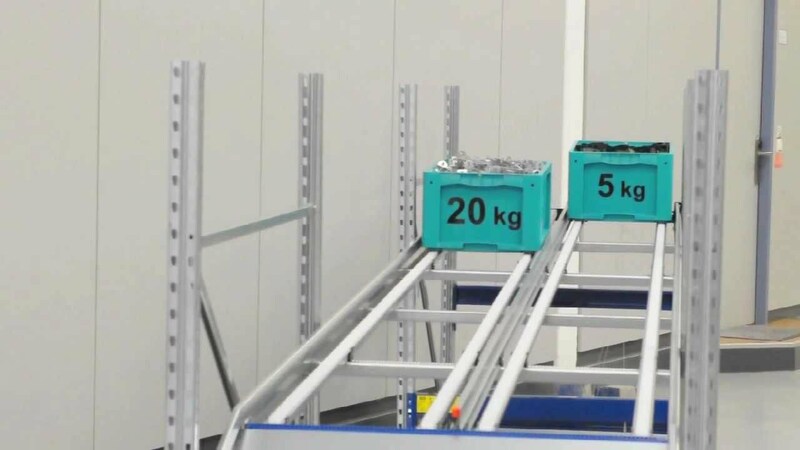 » As they store goods in a compact space, straight-line flow shelves have the advantage of making full use of a racking installation’s vertical space. This version is ideal for picking entire storage units. » Cranked flow shelves enable maximum visibility into stored containers. Ideal for picking individual items. Goods are more easily accessible, and items can be retrieved more quickly and easily. 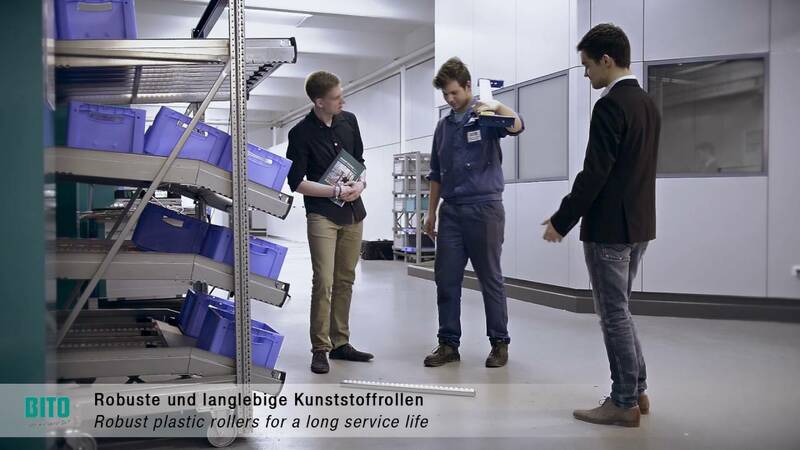 » Live storage systems with integrated conveyors increase picking efficiency and productivity several times over, as there is no need to turn the system around for a return journey. This system is ideal when picking items based on specific jobs, with each job assembled by picking staff. » Static BITO pallet racks can be easily equipped with floor-level flow shelves to add a dynamic picking zone . Travel distances and job throughput times are therefore substantially reduced. To refit the pallet racks, you can attach adapters from which the flow shelves simply hang. The flow shelves can be flexibly adapted, divided and vertically adjusted to meet your individual needs. You can also easily convert the rack back to its original state. » If you want to temporarily convert your pallet rack into a picking rack, the Adapta-Flow modules can be easily installed in the rack beams with a minimum of manual work. » A critical component of the live storage system is its roller lanes. BITO roller lanes are available with exceptionally narrow roller pitches. This guarantees quiet, consistent movement. They move exceptionally smoothly and have excellent travel properties, and their high running precision ensures goods move through the channel in as straight a line as possible. » Our top seller for all applications: plastic cylindrical rollers are particularly robust and can carry up to 4 kg per roller. The high-quality plastic, the outstandingly smooth roller movement and a broad running surface make these plastic cylindrical rollers ideal for all types of storage units. The smallest roller pitch is 28 mm. » These plastic containers are mounted on steel axles, giving them an excellent carrying capacity. They can carry up to 8 kg per roller. The rollers demonstrate consistently excellent movement ; the narrowest roller pitch is 28 mm. » Plastic flanged rollers are optionally also available in an electrically conductive version. » Flanged rollers are mainly used for storage units and containers with stable pre-formed edges. The use of these rollers eliminates the need for other lane dividers, improving the movement of light packages in particular. Carrying capacity 4 kg per roller, roller pitch 42 mm. Brake rollers slow down the flow of items by gently braking goods as they move down the full length of the channel. This means that stored items - even those of varying weights - can flow safely through the rack without being damaged. The use of brake rollers also enables storage on sharply inclined shelves and more compact storage in deep channels. The brake rollers are designed for packages weighing 3 kg to 30 kg.